(c) 2010, Outskirts Press, Inc.
Pastor Paul Sellman has produced a significant study in biblical theology for the modern context. Much like John Stott and Edward Fudge, Sellman came to his study of the issues of life, death and destiny convinced that people go to their rewards at death. His study of the scriptures has revealed a different outlook. He now sees that death is not the answer to humanity’s problem, it is part of that problem. The solution to humanity’s problem is Jesus Christ, whose return will mean the end of evil, and an eternal new beginning for the saved. The genius of Sellman’s approach to this controversial subject is his way of simplifying these very complex issues. He asks his readers to put aside their preconceived notions and to imagine all history as being represented by two ages: this age, and the age to come. This age is the age of mortality because humanity rebelled against God in Eden, thus lost the opportunity to take of the tree of life and live forever. The age to come is an age of restoration where God renews heaven and earth with life eternal as it was meant to be. The crucial event which will put an end to this age of mortality and usher in the age of eternal life is what the Bible calls the Day of the Lord. Sellman shows from scripture that this Day of the Lord is an event taught in both Testaments. It is the Day of Jesus Christ and the Day of his return, and Resurrection Day, and Judgment Day. It is the essential event in all history, since it divides the two ages. It corrects the problems of this age, and explains the destiny of those who will by God’s grace make it into the next. Sellman attacks some of the theological traditions within popular Christianity that tend to obscure this way of looking at things. Chief among these traditions is the concept borrowed from Greek philosophy that all human souls are already immortal. Sellman argues that this is “an unbiblical presupposition” (152) which has led Christians who read the Bible to “see something that isn’t there” (172). He calls this view “the great heresy of all existence” (195). Immortality was lost in Eden, and will not be gained back “until the rebellion that lost it is ended” (197). To Sellman, “good theology is based upon what is clearly taught, and then filled in by the less certain elements” (91). What is clearly taught in scripture is humanity’s need for eternal life in this age; God’s plan to fill that need in the age to come; and the Day of the Lord which will make God’s plan reality. So, until that great event of the Day of the Lord arrives, those who die wait unconscious in their graves for resurrection – either to eternal life or to the second death. That is why the Bible calls Christians who have died asleep in Christ. 1. The frequent use of the first person is a style matter, but it seems to detract from the scholarly nature of the study. 2. Quotes from the Bible are everywhere in this work, but the font, italics, and justification combined in quotations tend to make some of the text run together. 3. Sellman steers away from a number of technical and complicated issues and avoids getting carried away in discussing particularly problematic texts. This is a good thing, but might be seen by opponents of his position as “chickening out.” A few well-placed reference notes to popular works (like that of Stott and Edwards) which do get into those texts might help. 4. 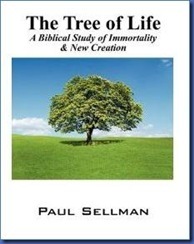 The Tree of Life is not yet available in electronic book format. If it were, this review would have been written sooner! The Tree of Life is a skilful and contemporary approach to questions that God’s people have been asking since the time of the patriarchs. It is the kind of book that pastors can pass on to new church members, who are just getting to know about the issues of life, death, and destiny. It helps to explain the way things are, and whet our appetites for the way things will be.